Kathy Griffin hasn’t stopped lampooning the Trump administration — but this time she’s getting a warm reception. 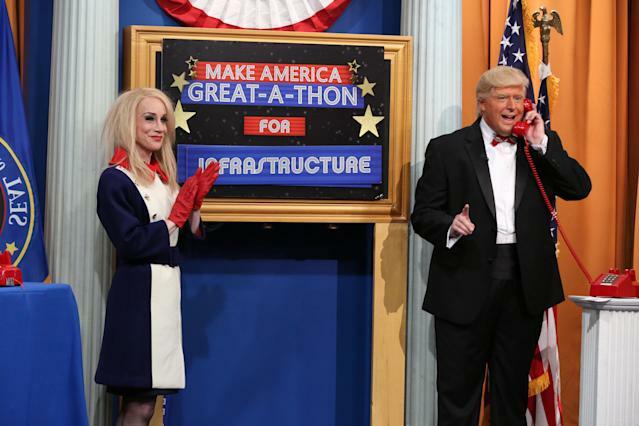 Last night, the comedian made her debut as Kellyanne Conway on Comedy Central’s Make America Great-a-Thon: A President Show Special. Alongside The President Show star and creator Anthony Atamanuik, who plays Donald Trump, Griffin debuted Conway’s signature “act”: defending the worst people in history. As the counselor to the president, Griffin passionately spoke up on behalf of Jeffrey Dahmer, Bernie Madoff, and Charles Manson. And Twitter was here for it. Watch Griffin, as Kellyanne Conway, defend Bernie Madoff. @kathygriffin as @KellyannePolls was BRILLIANT last night on @PresidentShow “Make-America-Great-A-Thon”! @TonyAtamanuik and crew brought the laughs while portraying the chaos! Great show and kudos for putting Kathy in the spotlight where she has always belonged! @kathygriffin you are slaying me on The President Show. Fully dead.